Major projects are risky. They’re complex. They’re costly. They’re high-profile. They’re interdependent. They’re prone to falling short of promised benefits and/or exceeding budgets. In short, they are challenging to deliver. And much of government’s work is delivered through major projects. With the publication on 6 January of our briefing for the Public Accounts Committee (PAC), Delivering major projects in government, and the recent creation of our new Managing major projects web-page, I’m delighted to share some of lessons we’ve identified from our review of hundreds of major projects over many years. 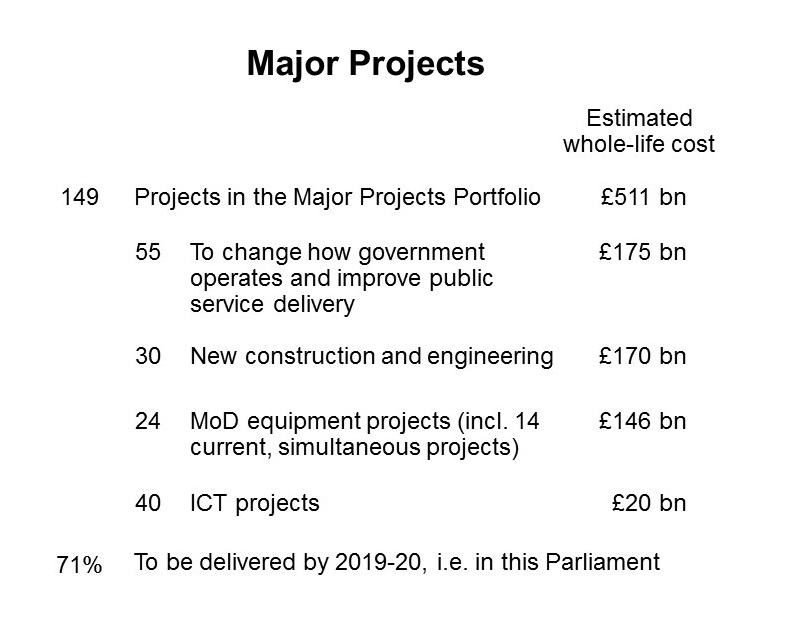 The table illustrates the scale of major projects across government. But this just covers the projects in the Government’s Major Projects Portfolio, there are many more delivered throughout government. Historically government departments have had a poor track record in project delivery. But as we point out in our Briefing, in recent years there has been a number of welcome developments to improve project delivery. Since our 2012 review Assurance for major projects, there have been improvements in accountability, assurance reviews, and leadership training programmes. Further progress is now being sought in project initiation and benefits realisation. But considerable challenges remain, especially given that 80% of the 106 projects due to be delivered by 2019-20 are to transform the way services are delivered. This is worrying because service transformation projects are at greater risk of failure to achieve their intended outcomes than infrastructure projects, which tend to have clearer and better delivery processes and needs. Our Briefing: Lessons for major service transformation sets out the issues that organisations have faced. What can individual departments and other organisations do to improve both the delivery and achievement of benefits of their major projects? 1) Early planning and testing options: projects are often initiated on the basis of over-optimistic assumptions, inadequate appraisal of alternative options and insufficient use of testing and piloting; with organisations becoming locked into solutions too early. Moreover, organisations frequently do not have a plan for failure, despite the seriousness of the potential consequences. 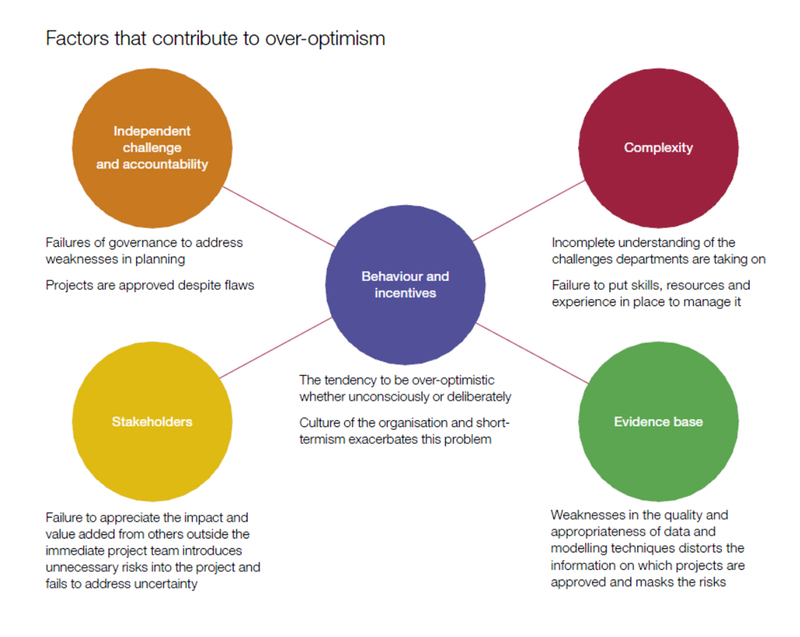 2) Portfolio management: organisations lack sufficient understanding of the interdependencies between projects, whether they have the capacity to take them all on and how to prioritise them. In Welfare reform – lessons learned we highlight the challenges the Department for Work and Pensions faced in managing an unprecedented number of reforms while cutting costs and coping with a surge in demand following the economic downturn. 3) Collection of clear and consistent data with which to manage performance and benefits realisation. The latter is a particular problem because once projects are completed and have become ‘business as usual’, those responsible for delivering the project typically aren’t the same people accountable for the end-user benefits, which can span decades into the future. 4) Capacity and capability: despite improvements in training, with a growing number of projects, there are still shortages of key skills, such as leadership, digital, risk management and behaviour change. 5) Clear accountability: this is improving, but the high turnover of Senior Responsible Officers across government presents risks to the effectiveness of the accountability process. We explore these themes in more detail in a number of NAO publications on our web-page. These include our guide to Initiating successful projects, and our reports Over-optimism in government projects and Lessons from rail infrastructure projects. 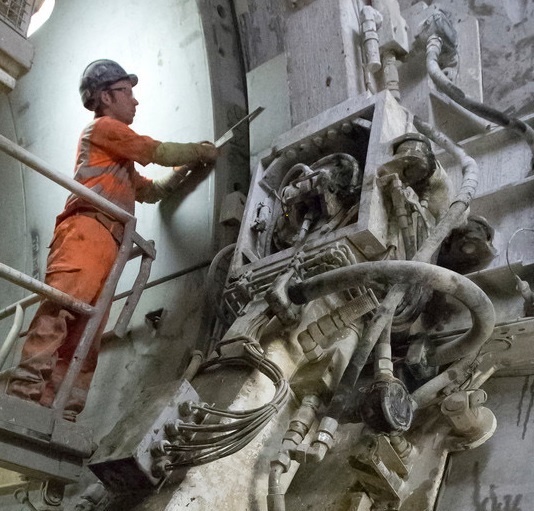 Major projects make a real difference to real people – from delivering much-needed infrastructure to fundamentally transforming public services. With many at risk of failing to achieve their objectives, I encourage all organisations undertaking – and particularly, planning – major projects to explore publications on our Managing major projects web-page. Please contact me if you would like to discuss any of our reports or the issues in them. I would also love to hear your comments on this challenging issue. 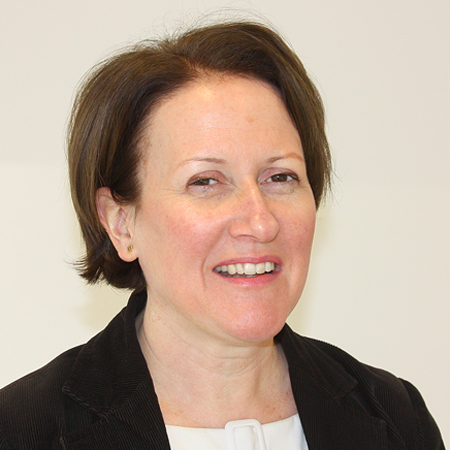 About the author: Geraldine Barker is the Director responsible for the NAO’s Project Delivery team, which leads and supports a network of NAO people who have expertise in reviewing major projects. The Project Delivery team ensures consistent and best practice approaches are applied by NAO teams, develops frameworks and guidance to support NAO teams and the bodies we audit, and shares good practice externally, including through speaking engagements and input to Parliamentary committees. Geraldine has worked in government for over 25 years, with a particular focus on major projects. She’s been a Director at NAO for 9 years. Well posted. There’s vital learning to be had from failure and what fails – as well as ‘what works’. Every episode of failure can be turned into a value-creating positive if we can effectively evaluate and learn from the findings. So much more productive that the traditional ‘blame game’. Good article. I found the ‘Over-optimism in government projects’ publication an interesting and sobering read. Sadly, my company finds the problem to be prevalent throughout the private sector as well as government (I say sadly, although I make a living helping to resolve such issues). Better training, better understanding, better leadership (at all levels) is what is needed.